Zubeen advocating against the practice of sacrificing animals as a ritual said,”Stop animal sacrifice”.Talking on Bollywood actor Govinda’s trip to Kamakhya to offer sacrifice to the Goddess, Zubeen commented,”Instead of sacrificing animals, Govinda must have offered himself”. “Maa Kamakhya never seeks such forfeit”, he added. Residents of Nilachal Hill, where Kamakhya temple is located witnessed Zubeen Garg on Monday night through a musical event. 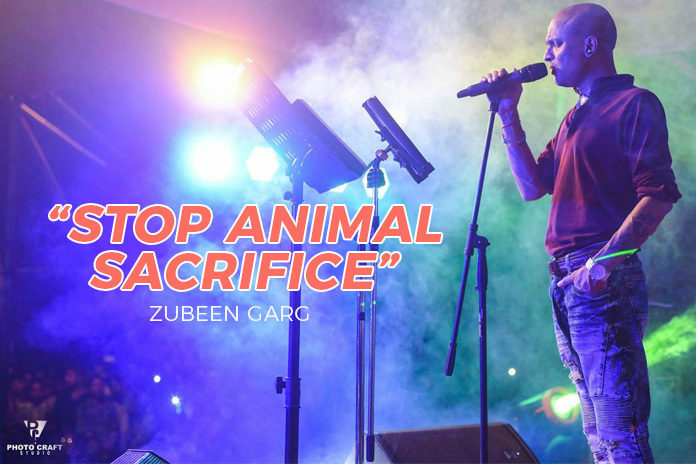 During this event, Zubeen made a request to the audience about ‘animal sacrifices’ and why one should protest against such practice. However, a section of priests at the temple do not completely agree with the views expressed by Zubeen and requested him to concentrate on his profession and not get involved with religious sentiments. The doloi of Kamakhya Temple Kabindra Sharma condemned Zubeen’s statement and said that he should not instigate people against religious rituals. Sharma added, “Zubeen is a singer and should stick to his profession. He has no knowledge about the significance of the holy rituals held at Kamakhya Temple. The rituals will continue the same way and Zubeen should not speak against it. These religious rituals have historical and mythological significances which the singer is not aware of“. Earlier, Zubeen had also made comments on Brahmins and the holy thread that marks their identity. Zubeen Garg e xocha kotha koise…Eyat khyama khujar kunu prosnoi nuthe.. aru Kamakhya mandir karu poiteek xompotti nohoi probex nixiddho koribole. জুবিন গাৰ্গে কোনো ভুল কৰা নাই । তেওঁ কিয় ক্ষমা খুজিব ?? Dhormo aru rajnitie sob ses kori dise.. I true humanity educated people never use a animal for fulfilling there wishes. Only uneducated, cruel, selfish and criminal people kill those innocent animals animals for their selfish motives. God left us thousands of years back..but seeded ill, illogical thoughts in some of our feeble minds. Even educated people kill animals…god knows what they took their degrees for if they believe in animal sacrifice…..instead of killing animals, sacrifice your children. Animals have families too. Maa Kamakhya came to Zubeen’s dream and asked him to speak against the animal sacrifice. And so he did so..???? kamakhyak maa buli koi maa buli kole akal manuhokei bujai neki jiba jantur nohoi. Kunu dorkar nai khyoma khujibo. Ki bhul kotha daal kole. Aru kun murkho keitai karobak Mandir t humuwa t badha dise o? Mandir tu ki hihotor bapekor hompotti neki? I support Mr Garg. We surely need to stop this practice ( nonsense )of animal sacrifice at Kamakhya temple. Satyar path kaitere bhora. Khuj di aguwai juatu kothin kintu akhomvob nohoi. In this case, I support Jubeen Garg for his straight forward and absolutely true opinion.